8bGames - 8b Bunny Escape is a point and click escape game developed by 8b Games. Imagine that you bought a cute bunny to your relative house as a present for Easter as a token of Family, Home and Love. Later your relative went away for shopping. Unfortunately your bunny got trapped inside a room in your relative’s house. 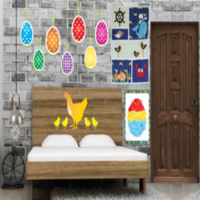 Find some hidden object to solve some interesting clues to escape the Bunny. Good luck…Have fun! hi, anyone else is playing? I am very clueless in this game. All I have solved is: 2 birds, small/big dots, 3 colors and 4 arrows. thanks for creating the games!! hi, where is the hint for arrows ? Haven't found where to use 3 grey flowers. Out now. Not rating this game very highly. I usually like these games, but I spent way too long looking for a place to put the 4 flowers. If all of them opened a zoomed in look, it would've helped. Had to look at VWT to see I had to click on the very last flower in the inventory. where do the gears go? Ginner, the "gears" are the "flowers". I thought the crossword clue coming from the game intro was a clever difference. I figured it out when I realized that some of the letters were fixed. Having black inventory items (remote and rag) go into black inventory slots, however, is very bad --I couldn't figure out what they were and thought at first I'd gotten nothing for solving the puzzles!